According to the Food Allergy and Anaphylaxis Network, at least one in ten children has a rashy skin condition known as eczema, or atopic dermatitis. Eczema is considered an allergic problem and is closely linked with environmental or food allergies, including dairy allergy. 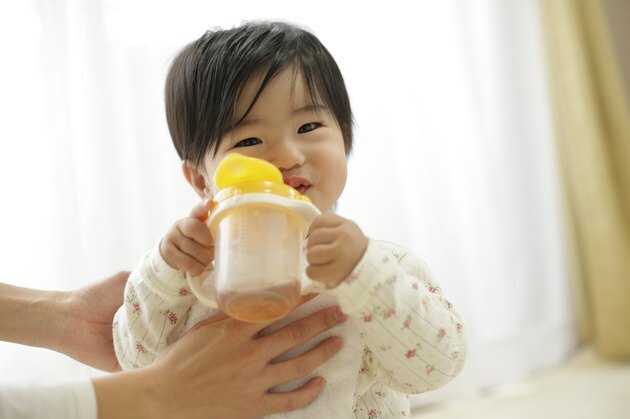 Although soy milk may provide a safe alternative to dairy, some infants experience intolerance of soy protein as well. Dairy allergy in an infant can be expressed in the respiratory, skin or digestive systems of the body. An infant allergic to dairy in breastmilk or formula may experience wheezing and cough, diarrhea and diaper rash, skin rash and hives or a combination of any of these symptoms. When symptoms continue after dairy is eliminated, another food allergy source, such as soy, must be considered. Eczema is more complicated than just red, itchy patches of skin. Eczema can result from irritations from food, heat or cold, dust or other environmental allergens, and eczema occurs repeatedly in an individual. Untreated eczema may blister and bleed, and damaged skin can thicken and scar. In addition to treating the symptoms of the rash, an effective treatment must include elimination of the food allergy, whether dairy or soy. Soy allergy, like dairy allergy, is one of the top sources of food allergy in the United States. In fact, soy allergy occurs more frequently in children already allergy to dairy. When soy and dairy are both allergy sources for an infant, they each can cause eczema, diaper rash and breathing problems. Some alternatives to soy for the growing infant or for the breastfeeding mothers include rice milks and yogurts. Food allergies are difficult to diagnose, particularly in young babies experiencing rashes and colicky symptoms that may appear random. Proper infant nutrition is crucial to healthy growth, so any changes to the nursing or formula diet should be done with health professional guidance. Nursing mothers can often achieve healthful diets for food-allergic infants, and specialty formulas are available from pediatricians as alternatives to milk- or soy-based formulas.